An active pattern of showers and thunderstorms will continue through the week as several fronts come into, but not through, the region. Today and Tonight: Similar to Monday, Tuesday will bring scattered action with about 50 percent of the 13 Parish, 3 County forecast area receiving showers and thunderstorms. High temperatures will stop near 90 degrees prior to development in the afternoon. Some downpours and frequent lightning will be possible. Overnight will be mostly cloudy with showers and thunderstorms possibly increasing near daybreak and low temperatures in the low 70s. Up Next: Another cold front will approach from the northwest on Wednesday. This one will serve as a focus for widespread clouds, showers and thunderstorms to develop Wednesday and Thursday. Due to this boundary serving as a trigger, activity will not be confined to the afternoon hours. Like earlier in the week, plenty of moisture in the atmosphere will lead to some downpours and frequent lightning. Temperatures during this period will not change much, limited to the mid 80s due to clouds and rain during the day, and held above average in the low 70s at night. Yet another cold front will tease the area next weekend. This one was sniffed out by our team early last week as the first possibility of lower humidity. However, it will likely struggle to get through our area, making us wait a little longer! 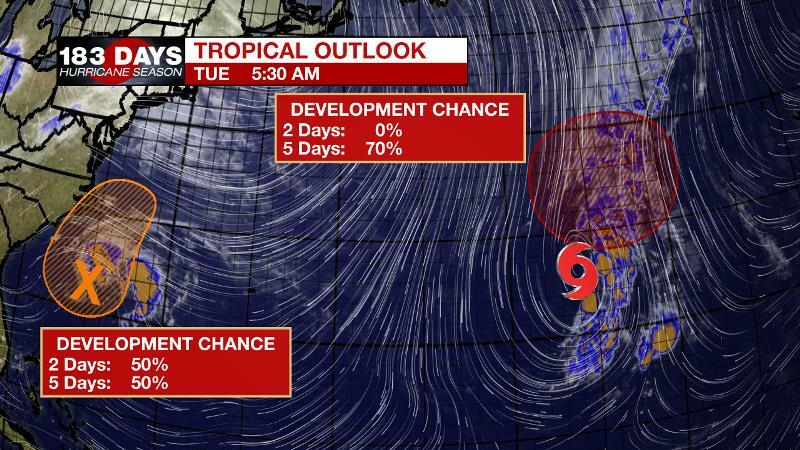 The Tropics: Leslie continues to churn as subtropical depression in the central Atlantic with little long-term prospects. 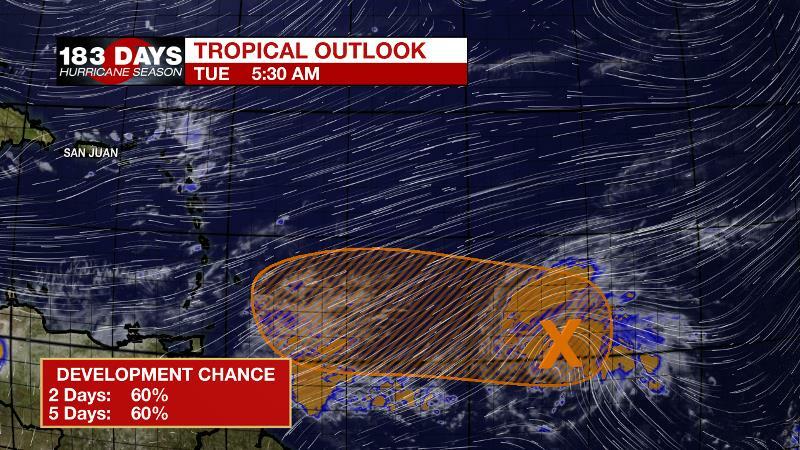 Two other tropical waves have a medium chance of development. The first, near the southeast U.S. Coast could provide increased showers and swells to the Eastern Seaboard. The second, is associated with the remnants of Kirk as has a window of opportunity for redevelopment before encountering some harsher conditions near the Windward Islands. An upper level ridge axis stretching a bit farther westward may cut down on the number of thunderstorms that develop on Tuesday as the area is in between frontal systems. The second cold front of the week will then approach the region, but through Wednesday, will remain north of the area. Pulling ample moisture northward from the Gulf of Mexico, the front will allow the recent trend of diurnally driven convection to continue with rather high rain coverage expected each day through Thursday. 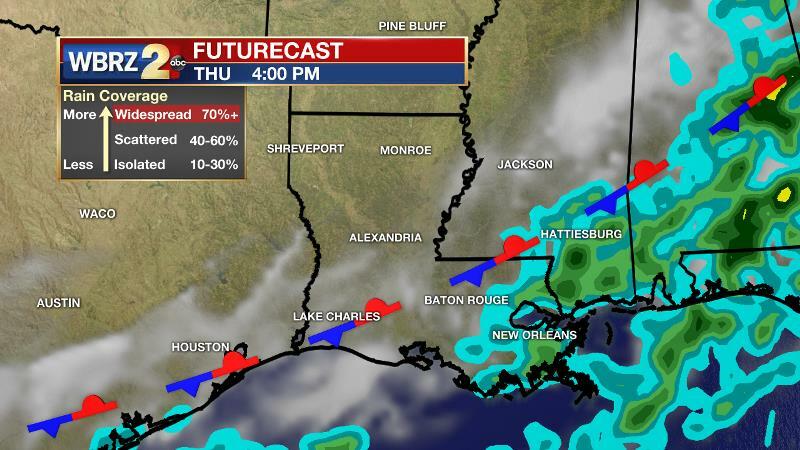 Very little day-to-day change in temperatures is expected, as that front will dissipate across central Louisiana. Yet another front will approach the area next weekend but it too looks like a big tease that will wash out before crossing the area. While this does not necessarily break humidity and provide relief, temperatures will be closer to average and the parade of fronts is an encouraging sign that the overall pattern is setting up to change.